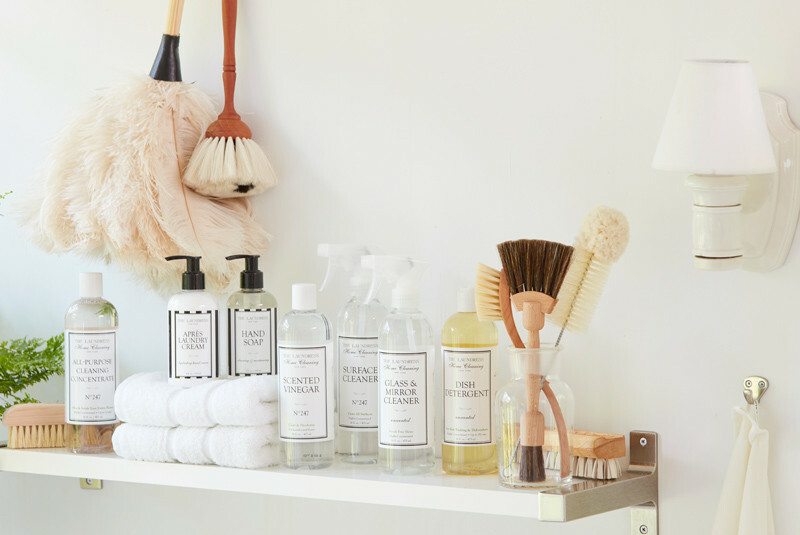 proudly formulated in the U.S.A.
Nontoxic and biodegradable: The Laundress products contain ingredients that are plant-derived (no animal by-products), and free of allergens, petroleum, phthalates, phosphate, parabens, and chlorine bleach. Natural Colors: No artificial dyes or unnecessary additives. Get Tips: We’re passionate about helping our customers get the most out of our products with resources like our How-Tos Stain Guide, videos, and laundry tips. Our nontoxic products combine the highest concentration of active ingredients, such as enzymes and plant surfactants, for top efficacy. Ingredients: Alcohol (aka Ethanol), Bleach Alternative (Oxygenated Bleach/Non-chlorine Bleach), Cleaning Enhancer (aka Builder), Calcium Chloride, Color Guard, Amylase, Cellulase, Lipase, Protease, Mannanase, Ethanol (aka Alcohol), Fragrance and Essential Oils, Grease Cutter, Sodium Gluconate, Starch, Surfactants (aka Surface Active Agents, Anionic Surfactants, Nonionic Surfactants), Vinegar. Free Of: Allergens, Ammonia, Animal Ingredients, Animal Testing, Artificial Color, Chlorine Bleach, Formaldehyde, Gluten, Parabens, Phosphates, Phthalates, Petroleum, Perchloroethylene, Volatile Organic Compounds (VOC’s). All Laundress detergents are proudly formulated in the U.S.A.
Our Lady fragrance is an herbal and citrus blend of rich amber, bergamot, lavender, and musk. Designed for the care of wool and cashmere, Cedar, is a modern take on the traditional woody scent, combining sandalwood, orange, and rose with a base of cedar. We love cedar’s natural moth-repelling properties! No. 247 scent is a fresh blend of eucalyptus with notes of pine and hints of rose, lily of the valley, bergamot, ylang-ylang and thyme. You may also notice hints of musk and lavender. At the heart of the rich and sophisticated No. 10 fragrance is a chorus of dark, almost sinister spice. Its sultry side is tamed by pure and fresh powder notes (this is laundry, after all). Warm and familiar musk rounds out this provocative, original accord. This thirty-one ingredient combination is designed to be both feminine and masculine. Le Labo Rose 31 is a chorus of warm, spicy, woody notes such as cumin, olibanum, and cedar, touched by a hint of amber, surrounding a centifolia rose scent. Thirty-three ingredients are blended together to create Le Labo Santal 33, a unisex, woody, and delicate scent with notes of cardamom, iris, violet, ambrox, sandalwood, papyrus, cedar, and leather.